The modern abundance of energy-rich foods combined with a shift to more sedentary lifestyles has led to a thermodynamic imbalance, and consequently, excessive caloric intake and reduced energy expenditure are the main causes for the prevalence of obesity. According to the World Health Organization (WHO) the obesity worldwide obesity has more than doubled since 1980. In 2008, 1.5 billion adults, 20 and older, were overweight. Obesity is now also considered as an epidemic by the French Health system. A recent report from the French Sénat pinpoints the dramatic progression of obesity in France and a « Plan Obésité » has been launched in 2011 under the highest authorities. According to the WHO, the fundamental cause of obesity and overweight is an energy imbalance between calories consumed and calories expended. And it is a fact that globally, there has been both an increased intake of energy-dense foods that are high in fat, salt and a decrease in physical activity. In adult mammals energy homeostasis is finely regulated. Blood glucose levels, body weight, and fat content remain within narrow ranges and experimentally-induced perturbations (e.g., food restriction) invariably result in a rapid return to ‘set point’ when normal conditions are restored. To accomplish this, circulating peripheral factors such as hormones (e.g., insulin, leptin, ghrelin) and nutrients (e.g., glucose, lipids) activate discrete neural circuits in the brain that trigger changes in the basal metabolic rate and/or feeding behaviour. Disruption of these neural circuits can give rise to life-threatening conditions that include metabolic diseases such as obesity and diabetes in both humans and rodent models. Therefore it is crucial to understand the mechanism that insures the proper equilibrium between energy intake and expenditure. 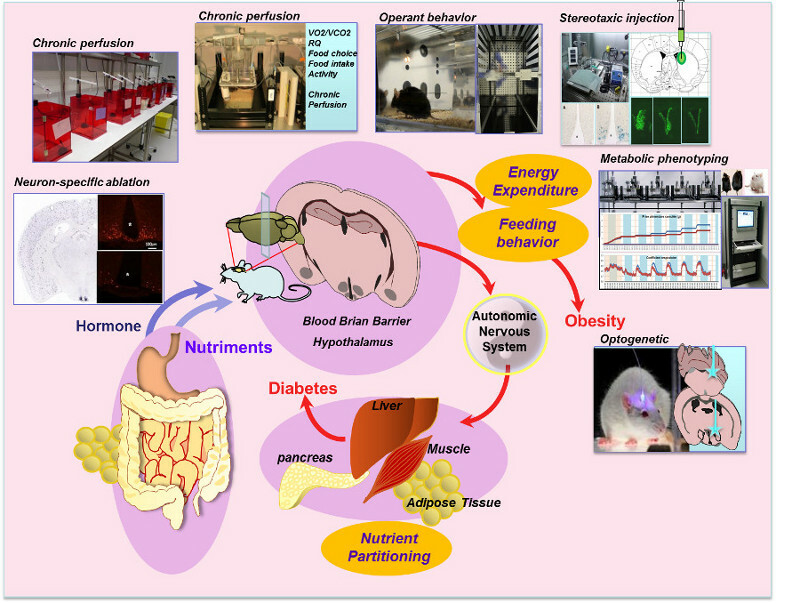 The core approach of the team is to leverage the power of modern molecular genetic tools and mouse models in integrated approaches in order to dissect out the role of discrete neural circuit elements in the control of different aspect of energy balance including feeding behavior notably in its rewarding & motivational component together with energy expenditure and nutrient partitioning. Circulating signals of hunger and satiety such as hormones (leptin, ghrelin) or nutrients are integrated at the level of the hypothalamus. Neurons that make Neuropeptide Y and the Agouti-related protein are part of the neurocircuitry that controls energy balance. Using genetic tools and integrated approaches our team is interested in the cellular and molecular basis of central control of feeding behavior, energy expenditure and nutrient partitioning and its implication in the etiology of obesity and diabetes. © 2019 Team 5: Central Control of Feeding Behaviour and Energy Expenditure (C2OFEE).